Happy Children's Day! It is a big holiday in China. 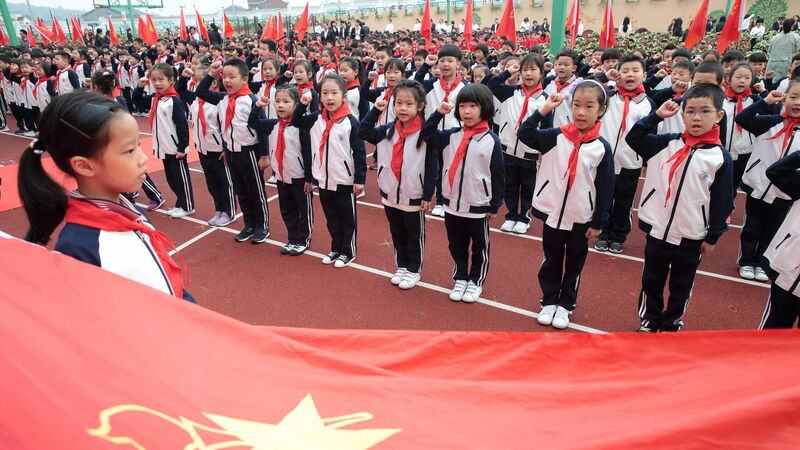 1 big thing: The "gene of revolution"
In honor of Children's Day, Chinese President Xi Jinping wrote a letter students at the Beiliang Red Army Primary School, located in a former revolutionary base in Shaanxi Province. Quote"to learn from heroes and role models, to love the Party, nation and the people, and to pass on the gene of revolution with practical action from generation to generation...be useful to the country, the people and society." Quick take: The PRC undertook a renewed campaign of Patriotic Education in the wake of the 1989 protests, and under Xi the patriotic education has become even more intense. U.S. Commerce Secretary Wilbur Ross has decided to go on his trip to Beijing this weekend for trade talks with senior Chinese officials, two administration officials familiar with the trip told Reuters. Why it matters: It was an up-to-the-last-minute decision. The Wall Street Journal's Lingling Wei reported this morning that he wouldn't decide until this afternoon, and that he would base his decision on the progress of his advance team in Beijing. This decision can be taken as a sign there has been progress towards a deal. The context: The brief lull in the growing U.S.-China trade tensions ended Tuesday when the White House announced investment restrictions and tariffs were going to happen. However, earlier this week, China announced a reduction of tariffs on over 1,000 goods along with measures to open more sectors to foreign investment. My thought bubble: Some may argue these moves are in response to U.S. pressure, but China needs to do this anyway. And, now that the U.S. seems to be launching a trade war with its allies, these measures may help China rally other countries to its side, and allow Xi to continue to claim China is the new standard bearer of globalization and free trade. Earlier this week Xi gave a speech to leading Chinese scientists and engineers in which he again stressed the need for China to innovate, take control of core technologies and become a global technology superpower. Why it matters: Technological independence and superiority has been the Communist Party's goal for decades, but with the contemporary confluence of capital, capabilities, talent and foreign pressure the Communist Party may be closer to fulfilling these goals than it has ever been. The ZTE deal may turn out to be a hollow victory for the Trump administration. It buys China time while spurring the nation to redouble efforts to create indigenous replacements for U.S. technology. It's also a popular nationalist rallying point even though it's embarrassing to the party as it affirms Xi’s focus on rejuvenation and the dangers of reliance on foreign things. Cover of the Foreign Correspondents' Club of China's 2017 report on how foreign journalists are treated. Western journalists in China tend to have a difficult time with PRC authorities, as documented in the Foreign Correspondents' Club of China's 2017 report on working conditions in the country. What's happening now: Two former correspondents are playing key roles in crafting U.S. and Australian policy towards China. As a reporter in a country without free media, Pottinger was harassed, arrested and forced to flush notes down the toilet to prevent their seizure. He was once even punched in the face at a Beijing Starbucks by a government thug who warned him to leave the country. China’s approach backfired spectacularly: His experiences as a foreign correspondent under siege shaped Pottinger’s views toward China’s authoritarian government, and, according to people who know him, remain in his mind as he advocates tougher U.S. policies to check its rise. 2. John Garnaut, once China correspondent for Fairfax Media and then an adviser to Australian Prime Minister Malcolm Turnbull, authored a secret report on Chinese Communist Party influence and interference operations in Australia. This has had a huge impact on perceptions towards the PRC not only in Australia but also inside the U.S. government. My thought bubble: Beijing may not have expected two former correspondents to have taken on such government important roles, but I doubt nicer treatment during their time in China would have changed their current views. I know both people, and have been struck by how much more hawkish they became after entering government and having to access to classified information on China. Quote"It was the world's first successful case of planting rice in a tropical desert area, standing as China's contribution to improve the capability of people in desert areas to be self-sufficient in staple foods, a move that can safeguard global food security and improve the desert ecological environment." The big picture: China faces a massive water crisis and so any crops that can grow in sub-optimal water conditions are welcome. And if these strains can help alleviate food and water issues around the world then it is good for the world and a soft power win for China. 6. China's "gale of creative destruction"
Axios' Steve LeVine writes: There is a new threat from Beijing, which is increasingly buying or reverse-engineering big tech breakthroughs and transforming them into cheap, commodity products, according to a Harvard professor. Why it matters: Speaking at a conference in Dallas, Willy Shih, an economist at Harvard Business School, forecasts "a gale of creative destruction," in which "whole [American] industries will be transformed, or may disappear." The context: China does steal intellectual property, and pressures U.S., German and other foreign companies to relinquish proprietary know-how in exchange for market access, Shih explains in a piece published May 29 in MIT Sloan Management Review. Yes, but: Shih says Western companies are confronted with another challenge, and that's the commoditization of their most precious intellectual property, contained within sophisticated tools that often "took years or even a generation to develop." "Tacit knowledge and know-how" can be reverse-engineered more easily than ever before, Shih writes. "Young competitors can skip years of practice and experience-building, and become competitive threats almost instantly." Chinese companies also can buy such tools from western developers who spend years creating them, but sell them because "only then can they justify the substantial investments and risks associated with pushing the boundaries on new technology." This approach turns science "into simply a matter of following a recipe. The tools make the process repeatable and take out the variability and risk. This can lead to rapid commoditization of whole product areas: All you need is the money to purchase the tools." The Diplomat — What’s So Controversial About China’s New Anti-Corruption Body?